Averrhoa. (For the philosopher and physician Averrhoës, who resided in Spain during the Moorish occupation in the 12th century; he translated Aristotle into Arabic.) Oxalidaceae. Two species of evergreen shrubs or small to large much-branched trees. Leaves spirally arranged to terminally clustered, imparipinnate, lacking stipules, terminal leaflet largest. Inflorescence loosely cymose, axillary or cauliflorous; flowers heterostylous; bracts small, caducous; sepals fused near the base to form a short tube; corolla creamy to dark red, marked white; petals clawed, free or fused above the claw; stamens ten in two whorls, or lower whorl with staminodes; carpels 5, united; ovary adpressed-pilose, styles 5, free, ovules 3-7, pendulous. Fruit fleshy, olive green becoming red when dry, indehiscent, variously angled. Seeds elliptic, flattened, endospermous, with or without arils. Originally indigenous to Malesia (Indonesia, India, Sri Lanka, Malaysia) but now cultivated and naturalised in many tropical and subtropical regions. Z10. Natives of the Asian tropics, they have been domesticated as a dooryard tree, and are primarily grown for their fruit, which may be harvested two or three times per annum and has a quince-like fragrance when ripe. Averrhoa bilimbi, the ‘blimbing’ or ‘cucumber tree’, has a sour gherkin-like fruit, containing up to 6% oxalic and citric acid, which is used in pickles and preserves. Native to the humid tropics, it reqires shade to thrive. Averrhoa carambola is an erect, symmetrical and low-branching tree, slightly more frost-hardy than Averrhoa bilimbi. It is grown for its golden-yellow fruit, which, with 3-5 characteristic longitudinal ribs, is now becoming familiar to Western markets. In favourable conditions, flowers and fruit are borne almost continuously. The trees suffer damage just above freezing point, although older specimens may be slightly more tolerant of injury. In cool temperate areas, grow in an intermediate to hot glasshouse, in a mix of equal parts peat and loam. Propagate superior forms by budding, grafting or layering; in the latter case, given satisfactory conditions, fruiting can be achieved within ten months. Also from greenwood cuttings in spring, with bottom heat in a closed case. BLIMBI. Shrub or tree to 15m, branches erect. Pinnae 7-19, to 12 x 4cm, variable in size, shape and pubescence, acute to acuminate, green beneath. Inflorescence to 20cm, paniculate, caulifloral on tubercles, fasciculate and pendulous; pedicels to 17mm, articulated near or below middle; sepals to 8mm, purple or yellow-red, sparsely puberulous, elliptic to lanceolate to spathulate; petals to 20 x 4mm, lanceolate-spathulate, clawed; stamens fertile; ovary to 4 x 2.5mm, ellipsoid, densly strigose, ovules 4-7 per locule. Fruit to 10 x 5cm, ellipsoid to obovate, round to broadly angular in cross-section, base tapering; seeds up to 14, to 7 x 6mm, exarillate. Range as for the genus. 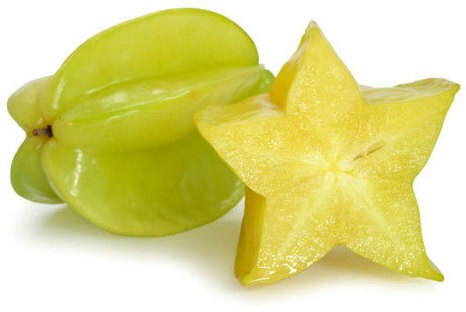 CARAMBOLA; STARFRUIT. Dense tree to 14m, branches often pendent. Pinnae to 10 x 4cm, variable, acute to acuminate, glaucous beneath. Inflorescence an axillary or caulifloral panicle; flowers unscented; pedicels to 6mm, articulated 1-2mm below flower; sepals to 4 x 2mm, bright red, obovate-oblong to triangular; petals to 8 x 2mm, obovate to lanceolate, short-clawed; ovary to 2.5mm, ellipsoid, puberulous, ovules 3-5 per locule. Fruit to 12.5 x 6cm, ovoid to ellipsoid, star-shaped in cross-section, lobed at both ends; seeds up to 10, to 12 x 5mm, aril fleshy, bilabiate, enclosing seed. Range as for the genus. 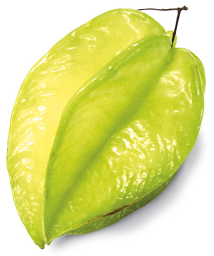 Star Fruit is best consumed when it is a fairly bright yellow with a touch of green; this is an indicator of ripeness. Unripe fruits will appear rather more green. The five ridges will show a somewhat brown tinge and the fruit as a whole should be firm to the touch. Overripe fruits will be yellow and have brown spots. All of the fruit is edible including the slightly waxy skin. It is very juicy but not overly sweet. 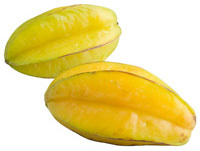 The overall flavour has been compared to a combination of citrus and papaya. 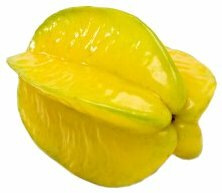 It is also a good source of vitamin C. There remains the caveat that star fruit contains oxalic acid which should be avoided by anyone who has kidney failure and indeed by anyone receiving dialysis treatment.